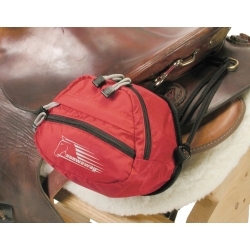 Urban Horse Promotes the Easycare Stowaway Hoof Boot Bag. The Ideal Way to Carry Any Hoof Boots Whilst Riding! The Easycare Stowaway Hoof Boot Bag will hold 2 x Easyboots / Epics / Grips / Gloves / Bares up to size 2, or 1 x hoof boot of size 3 and above as well as smaller accessories. Will also hold 1 x Old Mac or Boa Hoof Boot of any size as well as smaller accessories. This hoof boot carrying bag has a clip on top with tie strings to attach anywhere on the saddle.